For the 33rd time since 1986, well-known Filipino penitent Ruben Enaje, 58, the only penitent to be nailed to the cross for the longest time, will again be nailed to the cross on Good Friday. In a telephone interview with the Philippine News Agency on Monday, four days before his “crucifixion,” Enaje said he was ready to be “crucified” for the 33rd time in a row to fulfill the vow he made more than three decades ago. He made the vow “as my expression of self-sacrifice, thanking our Lord Jesus Christ for saving my life when I fell to the ground unscathed from a three-story building in 1985. “I slipped from the bamboo where I had been standing, and while I was falling I uttered the words ‘Dios ko!’ [‘My God!’], and the next thing I knew I was on the ground, but fully conscious. “It was a miracle I survived the fall without a bone broken. In fact, when I was on the ground I did not stand up immediately thinking I broke my legs and body, but after a few moments I found out I was okay. Enaje said it was only a year after the accident or in 1986 that it entered his mind that he wanted to be nailed to the cross as his self-sacrifice every Good Friday. “In fact, the first year of my being nailed to the cross, I did not tell my wife and children what I was about to do. They cried when they saw me all bloodied,” said Enaje, who is now 58. The site of the crucifixion is in Burol, a man-made elevated place in San Pedro Cutud village, some three kilometers from the city proper in San Fernando in Pampanga. 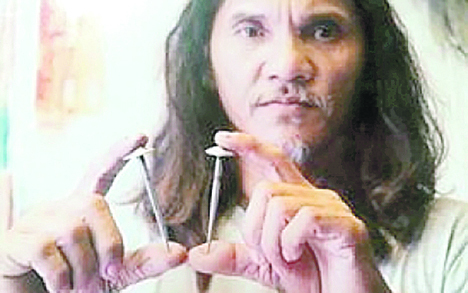 Four nails and the crown of thorns made of steel will be used by a “centurion” during Enaje’s crucifixion, and thousands of pilgrims are expected to watch. “The wooden cross I will carry measures 16 feet long and weighs 37 kilos, and I will walk 1.7 kilometers up to Burol,” Enaje said. He also recalled that in 1991, when Mount Pinatubo in Pampanga erupted and spewed tons of ashes that circled the globe, he was unfazed and he continued his annual ritual of being nailed to the cross. He also said some four other penitents were expected to be nailed with him to the cross on Good Friday. The Catholic Church has discouraged penitents from being nailed to the cross on Good Friday. “We are discouraging that practice because it was only Jesus Christ that made that great sacrifice, and only once to save mankind from sin,” priest Kit Ramirez of the St. Jude Parish in Malacañang said when contacted for comment. But despite the Church’s objection to the crucifixion performed by some Filipino penitents on Good Friday, quite a handful of them still practice the ritual that attracts people, including foreigners who come to the Philippines to witness penitents being nailed to the cross. But what is intriguing and that Enaje could not explain is that there are no scars on his palms and feet from the nails that pierced him.